Our archery club boasts a membership roster of 300+ people, many including families. Membership benefits include: access to the Clubhouse, access to member-only parking, and discounts on SFA-logo gear. The day-to-day needs of the club are run by the Board of Officers, who are members that are elected annually by the general membership. These officers run the daily activities such as range captain, scorekeeper, treasurer, secretary, webmaster, etc. We would love to have you join us as an SFA member. The membership year begins January 1st and ends December 31st. New members who join mid year pay a pro-rated rate. Participate in a minimum of three (3) out of 12 scheduled range maintenance days (aka “monthly parties”) per year or make special arrangements with the Range Captain. Kitchen & Snack Shack help – Clean up, set up or working in the kitchens / Snack Shack. Registration & Score Keeper help – Help register archers, keep score or time, or hand out awards. Being up-to-date on your dues. Attend and complete a minimum of two Membership Tasks. Submit your application using our online membership form. Wait for your approval. You will receive all membership notices via email. Once your membership has been approved, you will become a Probationary Level Member. Complete all of the Membership Task Requirements to move from a Probationary Level Member to an Active Member. You can renew your membership through our online membership portal. You must be current with all past dues to renew. If you have any questions about renewing your membership, contact the Membership Officer. 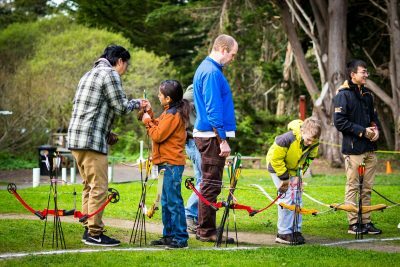 Northern California Field Archery Association (NCFAA). Membership in these organizations is not required, but is encouraged in order to support archery and bow hunting at state and national levels.